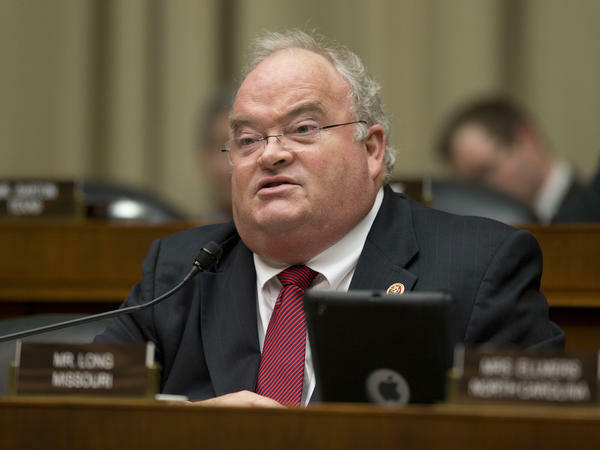 Rep. Billy Long, R-Mo., shown in a House hearing on Capitol Hill in 2014. Long, a former auctioneer, used his unique skills on Wednesday to drown out a protester. Missouri Rep. Billy Long left behind a career as an auctioneer when he took up his post in Congress in 2010. The woman, who was holding a cell phone on a selfie stick and apparently taking video of her tirade against Dorsey, was suddenly stunned into silence as Long launched into rapid-fire bid calling. "Twelve and a half, 15, 17 ...," he began as the woman tried and failed to compete and spectators looked on with amusement. "We're selling the cell phone there," he continued. Before finally concluding to laughter, "I yield back." Long, a Republican, is a former member of the National Auctioneers Association and the Missouri Professional Auctioneers' Association and owned his own auction company.